An aircraft, not a bird. The state is so gorgeously green right now. The man behind the hyperwoke Twitter account comes out. I’d always assumed it was the same person that ran Godfrey Elfwick, but apparently not. Thoughts on Marie Kondo from Lileks. I have too many books, and I’d never have time in this life (barring breakthroughs in life extension) to read or reread them all. I have a twenty-volume encyclopedia of the Illustrated Science And Invention, which may come in handy after the apocalypse, when all knowledge of technology has been lost, and we have to rebuild civilization, so that definitely stays. But I really need to organize all of my books, and papers. My office is a godawful mess. We’re closing on the house (just signed yesterday, and should get funds next week) and Monday’s my birthday (and the 33rd anniversary of the Challenger loss), so we’re splurging on a trip to Vegas this weekend. Be good in comments. SpaceX had a successful flight of a used booster this morning from Vandenberg, delivering the final birds of the new Iridium constellation. It was socked in in LA, so I couldn’t see it, but it looks like it was beautiful up on the central coast. Michael Baylor got a gorgeous shot, his first from a remote camera. The gray one has figured out how to climb stairs. This could be a problem. When I say figured out how to climb, I meant that she is willing to come down them now that she knows she can go back up. They’ve spent their entire life with us (i.e., since Saturday) upstairs, because our house is upside down, with the living area upstairs, and the bedrooms (including my office) down. They’ve been living in Patricia’s upstairs office/bath, but now at least the gray one will have the run of the house, including my office. The black one is a little less developed; when she fell halfway down the stairs on Sunday, I had to carry her back up. But it’s only a matter of time until they’re both heading up and down. These kittens are hilarious. I set down two bowls of food for them. One of them starts eating, and the other insists on eating from the same bowl. I pick her up and stick her face in the other one, and then she starts to eat from it. Last night, we named them: Ashe and Ember (Ashe is the gray one, and I spell it like Ashe Schow’s name: she approved). From our household, which just doubled in size with the new additions to the family. We’d been catless since Rerun died of abdominal cancer sixteen months ago. We hadn’t replaced her because (in addition to the fact that she was irreplaceable) things have been too crazy, with me traveling so much and the Florida house. But on Saturday, we decided to get ourselves a Christmas present, and provide one for cats that needed a home. They’re sisters, six weeks old, part of a litter of four (the other two were boys, who were adopted as well, by another couple). 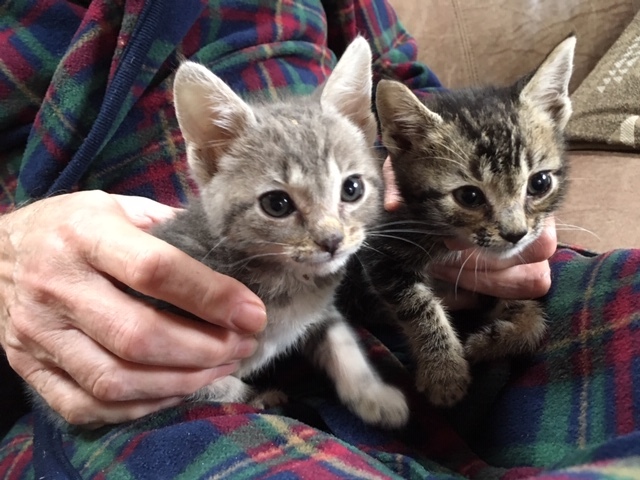 They’d been found in a homeless encampment in LA; their feral mother was ill with pneumonia and too sick to feed them, so they were raised on a bottle. But they’re very friendly and love to be held, and to fight with each other. I think they’ll grow up to be good cats, and good companions, to us and to each other. Yesterday, her second day in the house, the dark one on the right fell off the living-room ledge halfway down the stairs (about a sixfour-foot drop to a carpeted step), which literally scared the poop out of her. But we cleaned it up, and she seems to be using the litter box now. And here (via Instapundit) is a little Christmas gift from Allison Krauss and Yo-Yo Ma. For those curious, here is the recipe. I’ve long ago lost the box that the gun came in, but still have all the pieces, and keep them in a gallon ziplock, including the original instructions. I’m not sure which of the recipes she used (or I have, in the past) but they all require refrigeration before loading the gun, which is a PITA, especially if making multiple batches for different colors. What I liked about the Stewart recipe is that it can be done at room temperature, and it worked pretty much perfectly. But (as one commenter notes), do not use unsifted flour. It will make it far too dense if you measure it unsifted. Fortunately, I also have an ancient sifter from the same era (which I rarely use, now that I don’t bake much on a keto-ish diet).